"I've never prized safety, Erich, either for myself or my children. I prized courage." Line from an obscure Jimmy Stewart movie. Being brave is not something I ever really wanted for my kids. Oh, sure, I paid it lip-service. What kind of mom openly hopes her children will be cowards. But isn't this what I wanted? Children who lived lives of middle class comfort. Dressing primly and properly to attend church on Sunday, tithing the requisite 10%, then going on their happy way until next Sunday rolled around. Then, God set in my midst Mr. Great-heart, whom, upon hearing that there were countries where Christians were persecuted and didn't have access to bibles thought that he should just do something about that. He was 4 or 5. I verbally encouraged him, and, yes, I was proud that he'd do such a thing, but inwardly I was probably happy he was the only one of the five who did. Lately, not so much. Lately I feel this desire to pray that all my boys will be that brave. That they will look at the injustice that the world perpetrates and feel called to do something, regardless the risk. If they do, I must do the thing I really don't want to do...be brave myself. Coz that's what it comes down to for a mom. If her kids are brave, she has to be twice as brave. She has to support them in their battle, and wage her own in her heart and mind. I didn't really want to be brave. I wanted a life of comfort and ease, like everyone around me in our middle class America. I wanted to call what I was living brave, when it really wasn't. James 1:2-4 The Message Consider it a sheer gift, friends, when tests and challenges come at you from all sides. You know that under pressure, your faith-life is forced into the open and shows its true colors. So don’t try to get out of anything prematurely. Let it do its work so you become mature and well-developed, not deficient in any way. I was raised to think of hardship as a bad thing, or even more, as a punishment from a god who had it in for us, who was just waiting for us to cross that line, then he would strike us down. I use that as an example sometimes when talking to my kids on the importance of knowledge of Scripture. Pure Scripture, not just someone's interpretation of Scripture. As we enter into possibly another trial, this one centered around Babycakes and whatever it is that is causing his delays and possibly even seizures, I have been comforted by these verses. I was led to them yesterday in my study on Joseph in Abounding Hope. I've been trying to read them in different translations. They all come out saying what it basically says here in The Message. God does not give us these things because he is out to knock us around for our sins. There is therefore now no condemnation for those who are in Christ Jesus. As a recent convert to true & living faith (I attended church my whole life) I find all these truths of Scripture to be a beacon to lead me to trust in God. Between His Word and His Spirit I have been able to realize that God really does love His children. That just because this is happening again (and I can say again coz all my kids have had something) it is not because of some vendetta God has against me. He doesn't hate me and have a terrible plan for my life. Unless that's what He had for Joseph. These verses are major "stop whining" verses. It's hard to complain when you read that these trials are to help show your "true colors." I've been thinking about that a lot. What are my true colors? How strong is my faith, really? I know it's been getting stronger, but I still seem to trip over the simplest things. And, of course, I want out of this. I don't want this. In fact, when we go to the specialist I think I will tell him or her, "I don't want you to find anything wrong with my "baby." I want you to tell me he's perfectly normal and I am over-reacting." :) But we are not to try to get out of anything prematurely. We are to allow these trials to work in us so we become mature and well-developed. As I read through Scripture this certainly seems to be a big theme: You can't gain maturity without trials. The bigger the trials, the more mature you become. These things cause us to change. I know, my life has been one trial after another. Becoming a Christian hasn't changed that at all. But since coming to Christ I can see that the trials really do what these verses say. It's really been amazing. I can't see why it just isn't more popular. ;) Seriously, though, when you face trials with Christ, you don't have to be a complainer or a hater. You also don't have to be a stoic or a, well, whatever that type of person is that says, "que sera' sera'." With Christ you know that each of these trials holds a purpose and though you don't really want them, especially when they affect your children (come on, God, can't it just be something with me? why my little kids? please? ), you can know that through it all something beautiful will come from it. I don't know what's going on with BC. I don't know what the medical outcome will be. I don't know what any of this will mean for the long term, but I know that God has given it to me because He loves me enough to want me to grow in Him and closer to Him. And because He wants me to be His witness in this world. Who knows how many people I will meet as a result of this trial? How many of them might never have heard the Gospel? How many of them might be as miserable as I was before God saved me? There is a reason for everything. God is working to bring all things together for the good of those who love Him. And I pray that through all this I will be faithful, like Joseph, and that I will bring Him glory and honor. So, I learned a lot about my reading habits last month as a result of writing down the books I meant to read. 1) I am far more scattered these days than I thought. I'm more focused than I have been in the past, but I still need to work on it. 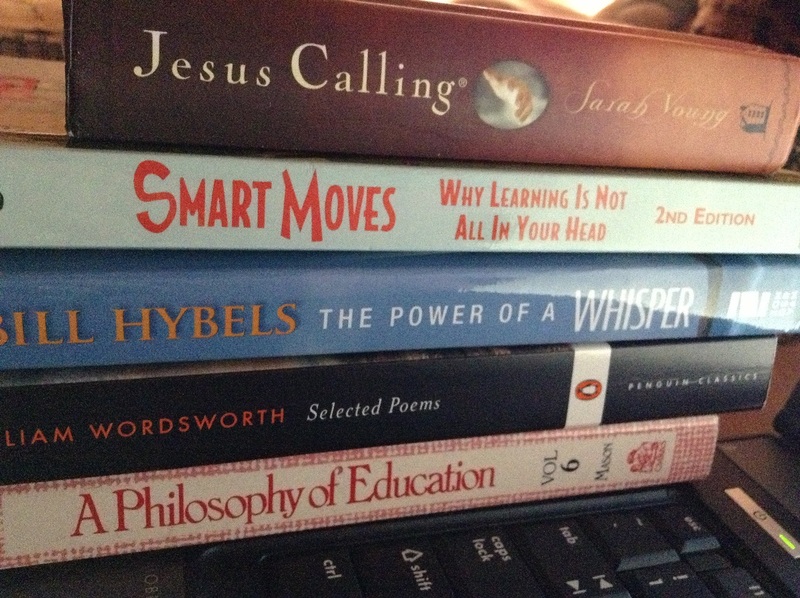 I finished Education Is...by Sonya Shafer. It was a nice, brief encouragement that encouraged creating an environment of learning for your child. So far Smooth and Easy Days has been similar, but with more specific information on forming habits. Smart Moves by Carla Hannaford. The violin teacher loaned this (and a few others) to me so I would like to finish and return it at least. This book has a lot of good things to say about child development that I think will be helpful for BC, and is making me reconsider some things I thought I'd do regarding his education. The Power of a Whisper by Bill Hybels. This book came along after I made my list and did cut into my list quite a bit. But our church was doing a series on it so I started. Now I find that I really do want to finish it. Been very eye opening, maybe even therapeutic. I'm going to put the Sanger book "on the shelf" for this month. That will probably encourage me to read it more. :D Yes, I rebel against myself. The other three are the same studies/devotionals. 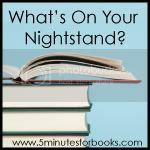 PPS Linking up with What's on Your Nightstand? at 5minutesforbooks.com.